Sweltering through temperatures of above 40 degrees, it was a tough days cricket for Australia’s top young female talent in Bendigo and Ballarat as a number of close encounters headlined an intriguing opening day of the Under 18 National Championships. With the round one games pushed forward to 9:00am in order to avoid the severe heat it was a fast start for all ten teams as they looked to get their tournaments off to a positive start. It was a low scoring encounter at Canterbury Park, as ACT/NSW Country scraped to a two wicket victory against Victoria Metro. Batting first, it seemed as if Metro had built a solid platform early as openers Tess Flintoff and Katia Jomini saw off the opening bowlers and put on 38 for the first wicket. However, once Flintoff was dismissed by all rounder Anika Learoyd for 19 the wheels fell off for the Victorians as they suffered one of the most incredible batting collapses you will ever see. Led by Learoyd (2-8), Alison McGrath (2-8) and Lara Graham (2-5), Metro lost their ten wickets for a staggering 27 runs with nobody apart from the opening pair managing to get past five. With their backs well and truly against the wall, it would take a mighty effort with ball in hand for Victoria Metro to even make it a close contest. Opener Olivia Thomas would get the ball rolling for her team, with the right arm quick claiming two early wickets to put the ACT/NSW Country chase under pressure early. Some small middle order partnerships would see ACT/NSW Country get the chase back on track, with scores of 13 for Learoyd and Anita Handono proving vital. With the target seemingly achieved, Victoria Metro would inflict one final scare into ACT/NSW Country as inspired spells by Holly Spencer (2-13) and Eve Sheehan (2-11) saw their opposition slip from 4-40 to 8-63. McGrath would come up trumps down the stretch however, backing up her excellent bowling performance by hitting the winning runs. It was a tight encounter at Harry Trott Oval, as a professional run chase by NSW Metro saw them claim a nail biting four wicket victory over the CA XI. After stumbling to 2-6 in the early stages courtesy of two early wickets by Isabelle Afaras, things were looking hairy for the young CA XI side. However, a classy 40 by Ruth Johnston would be the backbone of a solid first innings total, with smaller contributions from Phoebe Litchfield (20) and Ella Hayward (12*) also proving vital. With 105 needed to claim victory, the accomplished NSW Metro came out strong with an excellent opening partnership between Nell Bryson-Smith (18) and Maddy Darke (20) putting the CA XI on the back foot. 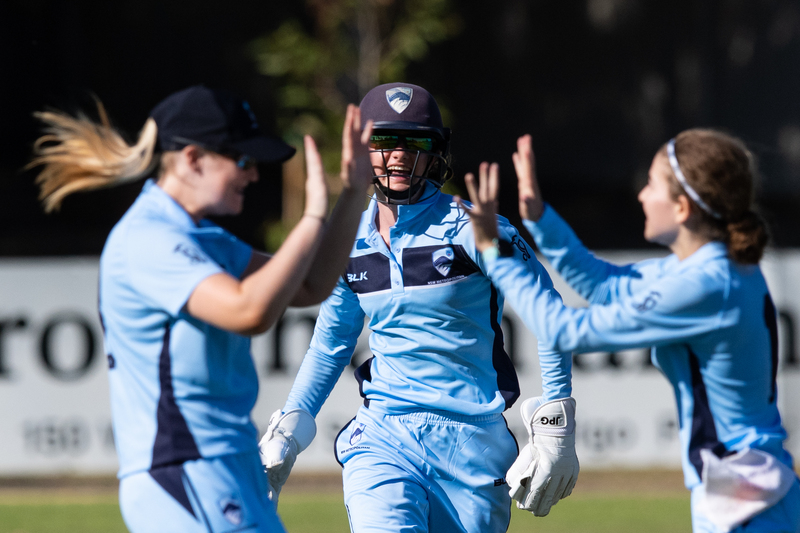 It would again be Johnston to bring her side back to life, as she took three crucial middle order wickets to leave NSW Metro struggling at 5-82. With the game on a knife’s edge, the CA XI bowlers simply weren’t good enough at the death, as a composed 11* from Angelina Genford saw Metro claim victory with three balls to spare. South Australia got their campaign off to a positive start, holding on for a dramatic one run win against Western Australia. Led by a match high 40 by opener Katie Rowe, South Australia’s top order illustrated excellent class and composure as they raced away to 4-107. Some excellent death bowling Zoe Britcliffe would bring Western Australia back into the contest as the South Australian simply could not put her away, claiming brilliant figures of 2-4 off of three overs including a maiden. A late innings collapse of 4-5 would see the South Australian’s end up with a moderate total of 112, leaving the door wide open for Western Australia. In what was always going to be a tight run chase, Western Australia started positively with openers Gorgia Platten (29) and Britcliffe (22) putting on 55 to get their side off to the ideal start. With the game slowly slipping away, it would take an inspired spell of bowling by all rounder Stephanie Beazleigh to breathe life back into the South Australians as she ripped through the top order to claim figures of 3-11. Struggling at 5-84, Western Australia would muster by one last effort to chase down the 113 required for victory as Ashlee King and Olivia Purnell put on 27 to get them within touching distance of a famous victory. However, a final over run out would see momentum fall back with the South Australians at the right time, as they managed to hold on for a pivotal round one victory. Queensland produced the most dominant performance of the round, as a huge first innings total of 152 would prove too much for Tasmania. Batting first, Queensland would get off to the perfect start with opener Charli Knott proving the foundation of the innings with a match high score of 47 off 54 deliveries. Fellow opener Ellie Johnston was also excellent with 27, whilst number three Lily Mills also contributed with 24 as Queensland piled the runs on. Amy Smith was the shining light for Tasmania with ball in hand, as the right arm leg spinner toiled hard for figures of 3-26 from her four overs. With a monster task at hand, the Tasmanian run chase never found its momentum as Queensland backed up their powerful batting with clinical bowling. Quick Emily Vallance and leg spinner Neve Lynch would be the standout performers claiming figures of 2-13 and 2-22 respectively, whilst for Tasmania Emma Manix-Geeves showed her power hitting with a quick fire 21 off just 19 deliveries. Victoria County cruised to a six wicket victory over Northern Territory at Dower Park Recreation Reserve. Batting first, Northern Territory suffered an unfortunate start to their innings as both opening batsmen were run out in the early stages of the innings. However, a strong showing from the middle order would restore hope in the batting effort as Ruby Strange (37) and Kira Holmes (26*) played superbly to catapult their side up to a respectable score of 107. Set a nervy 108 for victory, Victoria Country’s top order would be the difference as after losing an early wicket, opener Sophie Van De Heuvel and number three Lucy Cripps put on a 87 run stand to take the game away from their opposition. Clodagh Ryall was the shining light with the ball for Northern Territory as the opening bowler took 2-13 in a class spell of fast bowling. Van De Huevel would be the star of the day however, as she posted the first half century of the tournament in her side’s six wicket win. ACT/NSW Country continued their unbeaten run in this afternoon's round of matches, defeating the Northern Territory by eight wickets. The NT made a positive start with the bat, reaching 54 before opener Jessica Bradley (33) was dismissed. The ACT/NSW Country bowlers continued to apply pressure with the ball and were rewarded with wickets at regular intervals. Allison McGrath (3-5) and Lara Graham (3-14) were the pick of the bowlers, helping restrict the NT to 7/103. In was a clinical run chase from the ACT/NSW Country side led by opener Sarah Young who scored an impressive 59 off 49 balls including seven fours. Anika Learoyd (15*) also reached double figures as she provide great support to Young, the duo ensuring they saw their side home with over six overs to go. South Australia also remains undefeated after day one thanks to a comfortable victory against Queensland. An outstanding effort with the ball from Bella Smith saw her claim four wickets, while Darcie Brown was also in fine form, conceding just nine runs from her four overs. With the bat it was Courtney Sippel (33) and Lilly Mills (21) who did the bulk of the scoring in Queensland total of 7/106. Opening bat Katie Rowe continued her great start to the Championships, adding an unbeaten 55 to her morning total of 40, as South Australia cruised to victory with eight wickets to spare. Rachael Church was also handy with the bat, chipping in with 21 runs batting at number three. In a low scoring affair, the Cricket Australia XI proved too good for Western Australia in their clash, the youngsters putting in an impressive all-round display to claim their first win of the Championships. An even contribution from all all eight CA XI bowlers helped restrict WA to 9/78, with Jade Allen claiming two wickets. Defending a low total WA's bowlers claimed two early wickets to have SA 2-33 but an unbeaten 38 to Phoebe Litchfield and a patient 16 from Kayla Burton was enough to see their side over the line with four overs to spare. In the final match of the afternoon, NSW Metro put on a clinic with the bat to overcome Victoria Country with ease at Harry Trott Oval. Batting first, NSW posted an imposing 3/187 with Sydney Thunder player Hannah Darlington (53) and Maddy Darke (61) both posting half-centuries. In reply Alyssa Humphries (25), Merinda Hale (20) and Sophie Van De Heuvel (15) all dug deep for the Country side, but the chase proved too much, the Victorians only managing 8/108 from their 20 overs. Isabella Malgiolio (3-18) and Shivani Metha (3-18) were best with the ball for NSW Metro, claiming six of the eights wickets.